Imagine you’re in the middle of your second semester Junior year and you’re taking 5 courses. In order to keep a GPA of 3.25, you really need to pull off at two A’s and 3 B’s this semester. You’re stressing out because that’s gonna be pretty tough, especially with your one professor Mr. ithinkthisistheonlyclassyouaretaking. You step back and look at all your classes as a whole and you realize there’s one class that will be a total breeze. You know you can pull an A in there without working too hard. Then you recognize there’s one other class where you can team up with your super smart best friend and probably swing an A in there as well. So you decide to focus on those and make sure you pull A’s and then just make sure you’re doing enough to pull B’s in everything else. This strategy leaves your harder classes for the B’s. It’s still going to be tough, but totally doable. Now imagine you were in the same situation, but instead of viewing the semester as a whole, you looked at each class individually. Imagine trying your hardest to get an A in everything without recognizing that some classes are easier than others. Well, you might end up stretching yourself too thin and end up with more B’s or maybe even a C because you were trying to get A’s in everything when that just wasn’t practical. You end up doing worse overall because you viewed everything by itself, instead of as a whole. It’s the same way with your retirement accounts. Investing by itself is confusing enough and understanding how your retirement accounts work together is even more complicated. Over your lifetime you will likely end up with multiple accounts and have money all over the place. You might have your 401K, your spouse’s 401K, your old employer’s 401K, your IRA, your spouse’s IRA, and possibly even a taxable brokerage account. Good grief, that’s a lot. By the time you’re in your late 30s it’s very easy to have upwards of 5 different investment accounts and it’s all very confusing. The problem here is that it’s very tempting to look at the options in each account and try and pick the best investment from those options. But there’s a huge problem with doing that. It disregards the options you have in your other accounts and where your money is invested inside those accounts. A better way is to view all of your accounts as one whole portfolio. Now, for the purposes of this article, I’m just going to focus on viewing your “retirement” money as one portfolio. For most people, the money in your 401ks, IRAs, and brokerage accounts will all be used for retirement. You may have some other investments that aren’t designated as “retirement” money. Maybe it’s investments you are using to generate income now like Real Estate holdings or dividend stocks. You could also have some shorter term goals like saving to buy a home or investments for your kid’s college fund. But I’m just going to focus on money for retirement that’s separate from your other goals. I alluded to the idea earlier that viewing each account separately creates problems. And all of this can cause issues. Let’s say that you are in your 30s and want to hold a portfolio with 85% stocks and 15% bonds. So in each of your individual accounts, you try and buy mutual funds in a way that makes your account have an 85/15 split. If you do that for your 401K, IRA, and brokerage accounts separately, you are likely to end up with similar holdings in each account. You might have your stock holdings in S&P 500 index fund for your 401K. But the stock holdings in your IRA might be in a Vanguard Total U.S. stock market fund. The problem here is that all of the stocks in the S&P 500 fund are also in the Vanguard Total U.S. fund. That means you’ve got the same stocks doubled. And if you have way more money in your 401K, then you might not be equally diversifying your investments. If that seemed confusing or didn’t make sense to you at all, go read this article on how the stock market works and then read this article that explains mutual funds. 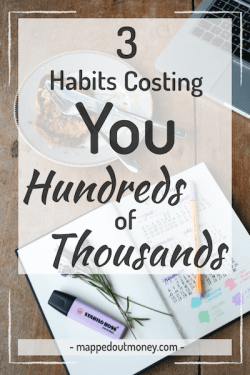 The bottom line here is that if you view your accounts separately, there’s a big chance that you’ll miss something by having too much money in one area and not enough somewhere else. In order to make sure that you’ll have enough money in retirement, you’re going to need to view all of your accounts together as one big pot of money labeled “retirement”. Now you might be wondering how you can practically do this. It would be ridiculous to try and download your statements from each account holder at the end of the month and sit down with a calculator and figure it all out. Luckily, there are a few tools that make this process much easier. Actually, there are a ton of tools that will help you bring all of your accounts into one place and let you view everything together. I used to use a software called Quicken but recently switched to a free online tool called Personal Capital. Right now my wife and I have 3 investment accounts: a 401K, a Roth IRA, and a taxable brokerage account. I have all of these accounts synched to Personal Capital, and it pulls in all of the relevant information and gives me a snapshot of my accounts as a whole. 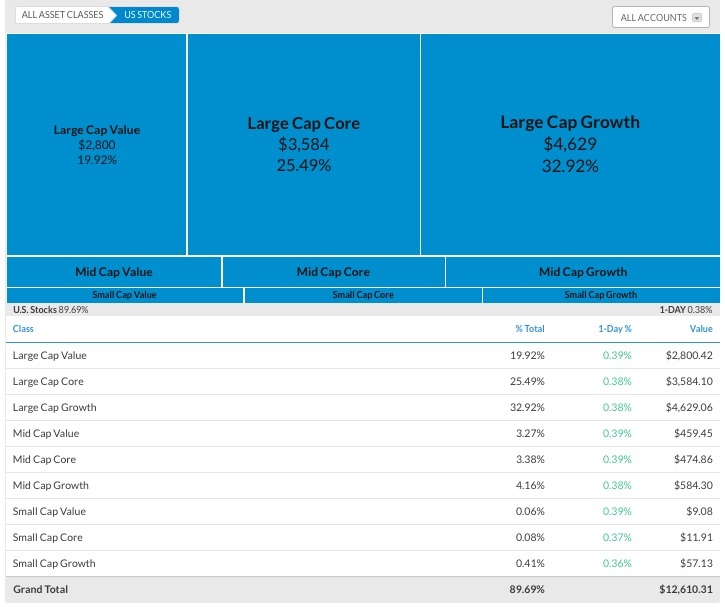 I can see the account balances, what each account is invested in, how much money I have in each asset class and the mixture of asset classes across all of our portfolio. Take a look at the home screen for my Personal Capital dashboard. Notice the arrows I show pointing specifically to the investment accounts. I can quickly see the balance of each account and how it fits into my overall net worth. You’ll also see the net worth tracker in the middle of the home screen which gives me a nice quick look at where I am and if I’m trending upwards or downwards. This is extremely useful because it allows us to see where all of our money is relative to each other. Then we can make decisions about how we want to invest in the future. Now, Personal Capital works extremely well for the average person. If that’s you, then skip this next section and jump down to the Use Money and Asset Classes heading below. If you’re a super nerd like me, keep reading. So for the super nerds, in addition using Personal Capital, you can create your own custom spreadsheets in Excel. I’ve created a spreadsheet that I can update manually at the end of each month and it will show me my asset allocation compared to my target allocation. This simply means it shows me how much money is in each type of investment relative to my goals. Then the spreadsheet shows me how far off I am from the goal and how much I need to invest in order to get back on track. This is a process known as rebalancing. If you’re a super nerd like me, you can build something similar and geek out over it too. 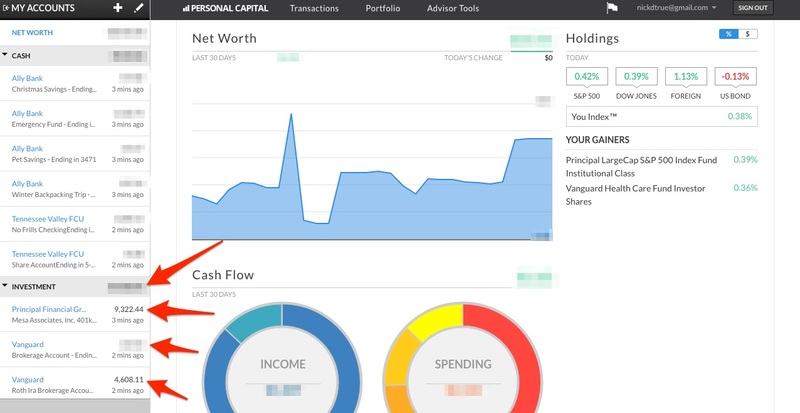 Personal Capital is a great free tool that gives you an overview of your current situation and helps you make decisions about your future investing. They do have some expensive paid services that I don’t use or know much about. But their investment tracking software and net worth tools are fantastic! However, if you want to go super in depth, you may need a custom spreadsheet like the one I show above. Okay, sure there are a few tools that can help you, but in order to truly understand this, you need to re-frame the way you’re thinking about your portfolio. When you think about Cash you normally have 1 of 3 places that this money stays. When you’re talking about cash, you think in terms of account balances. 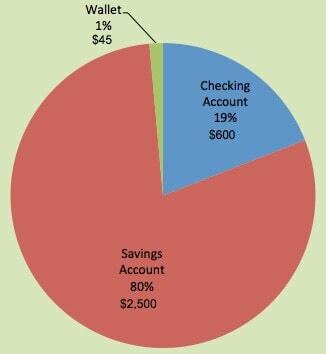 Your checking account has $600, your savings has $2,500, and you have $45 in your wallet. But when you think about your investments, you need to stop thinking about account balances. Instead, start thinking about the money in each Asset class. 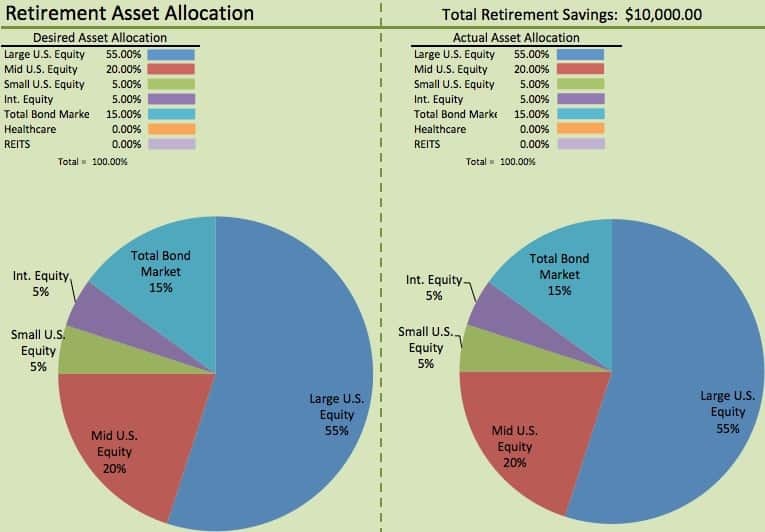 You need to go from thinking about $2,000 in your 401K to $500 in X mutual fund, $800 in Y mutual fund, and $700 in Z mutual fund and all of it is inside the 401K. It doesn’t matter how much money is in the 401K. What matters is how much money is in each specific investment. Look at this image again. Notice I don’t have the pie chart split up based on the type of account it is. Instead, I have it split up based on the asset classes I’m invested in. Like I said earlier, Personal Capital allows you to easily see how much you have in each asset class. 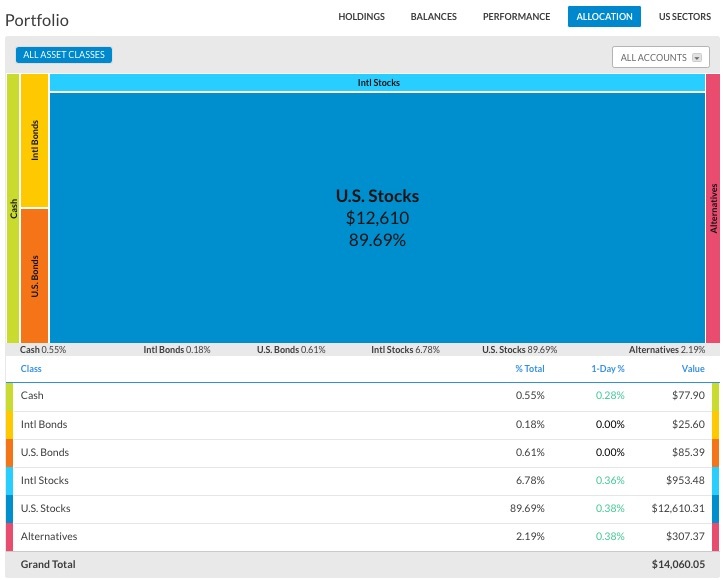 Here you can see that Personal Capital shows an allocation of almost 90% U.S. stocks, and the other 10% broken up between bonds, cash, and international stock. You can then click each class to see a further break it down. Now you can see that the U.S. portion is actually broken up into a variety of stocks ranging from small to large with a heavy weight towards Large-cap Growth. This is what I mean when I talk about viewing your money based on the specific investment instead of the account balance. I’ve already discussed the issues of viewing your accounts separately, but I want to briefly touch on why it’s important to view them together. And it all comes down to one main word. In investing, rebalancing has to do with staying on track. Going back to our example above you might be trying to maintain a balance of 85% stocks and 15% bonds. If your balances ever get too far away from that 85/15, you would Rebalance your portfolio to get back to 85/15. That means either buying more of an asset class or selling some of an asset class. So for a portfolio of $10,000, you would have $8,500 in stocks and $1,500 in bonds in order to get an 85/15 split. But over time your stocks may rise so much that your stock balance is $13,500 but your bond balance is still only $1,500. 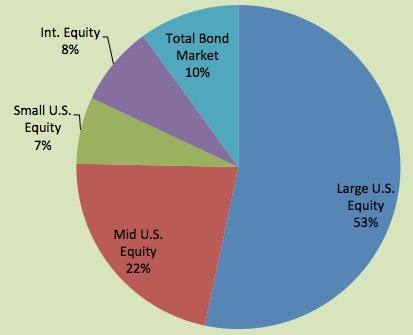 Now your stocks represent 90% of your portfolio and bonds only account for 10%. This means you either need to buy more bonds (with new money) or sell some stocks and purchase bonds with the money from stocks to get back to an 85/15 split. But this is an important concept to understand in long-term investing. 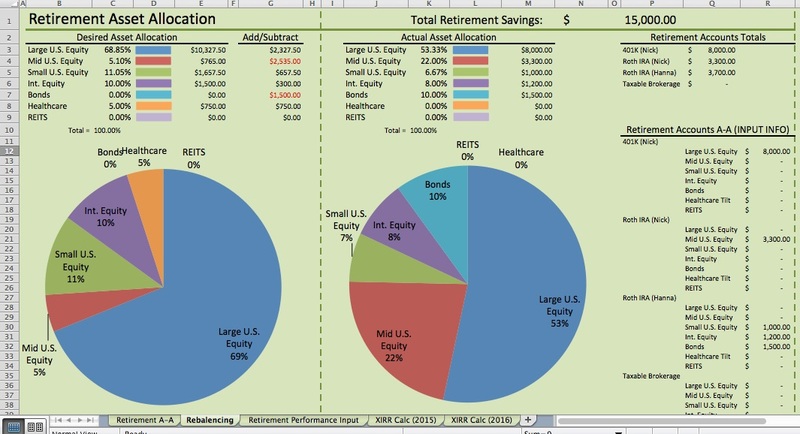 And the only way to do this accurately is to think about your portfolio as a whole and not by the individual accounts. Let me give you some pictures. Here’s your portfolio at day 1. You have 85% in stocks and 15% in bonds. For bonds you just have all 15% in the Total Global Bond Market fund. 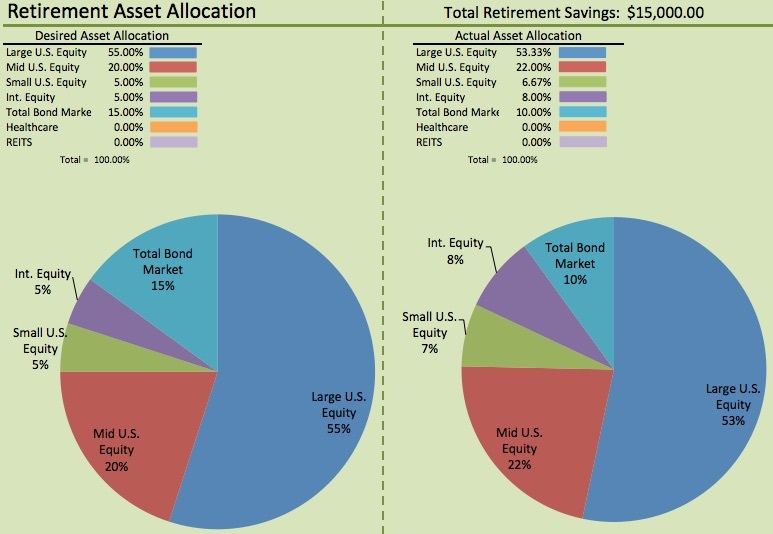 After a year you re-visit your Asset Allocation and notice that your stocks have increased quite a bit to $13,500 but your bonds have stayed the same at $1,500. Maybe this happens because of the specific fund you are automatically contributing to inside your 401K. But no matter, by looking at your portfolio as a whole you can easily see your current Asset Allocation and what you want it to be. 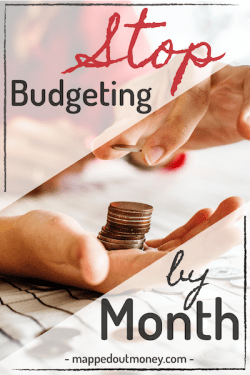 Since you want to get back to the percentage allocation you started with, you will need to either start contributing more to bonds or sell some of your stocks and then buy more bonds. Either way is fine and gets the job done. But again, this would be impossible to know if you were trying to look at each account separately. 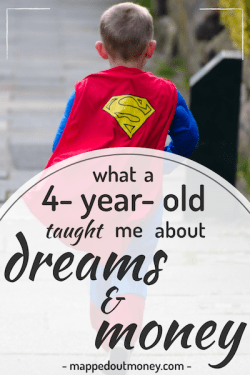 I talk a lot about finding financial freedom. 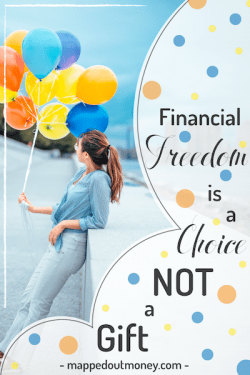 Heck, I even have a Free course on how you can choose financial freedom. Lot’s of people all over the internet talk about financial freedom and financial independence. 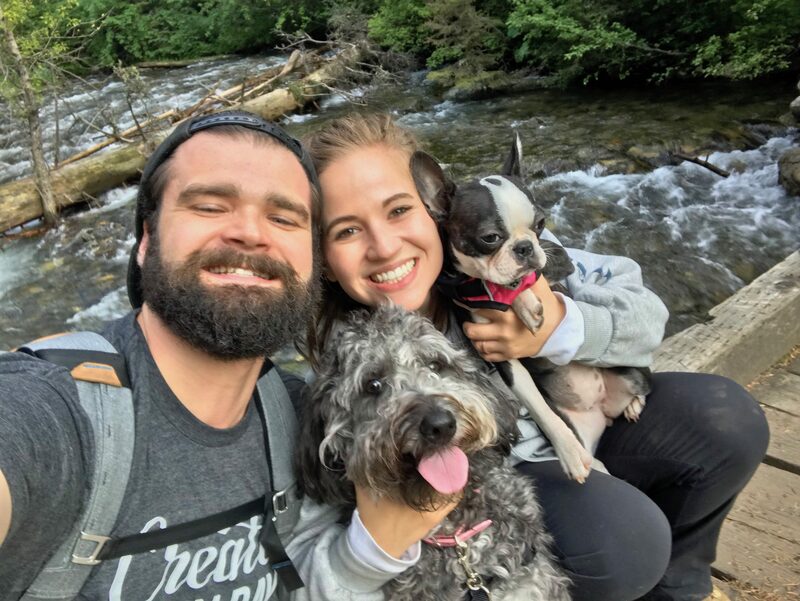 Well, now you know that when people talk about getting to a specific “freedom number.” Or when people talk about reaching a certain number before retirement, they’re talking about their retirement portfolio as a whole. Just like what I’ve shown you above. When someone says they want to have $1,000,000 before they retire, that doesn’t mean their 401K must have $1,000,000 in it. It just means that the balances from all their retirement accounts should add up to $1,000,000. 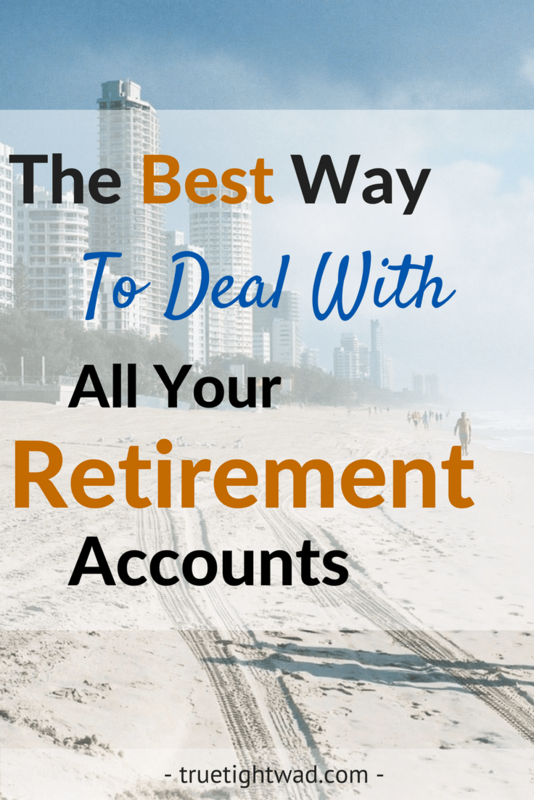 When most people retire all of their money isn’t in one account. They likely have some 401Ks, some IRAs, and some taxable brokerage accounts. It’s highly unlikely that you’re going to stay with the same employer for 40 years and only have one 401K. Throughout your life, you will likely have many different accounts. So it’s important to view these accounts together and aim for reaching a combined number across your accounts instead of looking at each one individually.